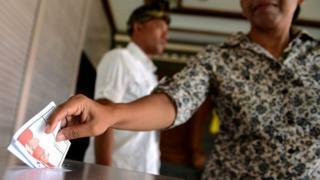 About 192 million people in Indonesia are eligible to cast their vote in a general election on 17 April. For the first time, presidential, parliamentary and regional elections are all taking place simultaneously on one day. It's a massive democratic undertaking which will determine the future identity of a vast and diverse country. What's going to happen on 17 April? About 245,000 candidates will be running for more than 20,000 national and local legislative seats across a country made up of around 18,000 islands and covering 1.9 million sq km (735,400 sq miles). The Lowy Institute, an Australian think-tank, calls it "one of the most complicated single-day elections in global history". Initial results will emerge within hours but it will take a few weeks for the final results to become clear. Who is running for the presidency? It's a battle between current President Joko Widodo and Prabowo Subianto, a former military general. They also went face-to-face in the 2014 elections. Mr Prabowo is closely associated with the traditional political elite. He was previously married to the daughter of former dictator General Suharto, who ruled Indonesia with an iron fist for three decades. He has been dogged by allegations of complicity in human rights abuses committed under Gen Suharto, though he has maintained his innocence. After spending many years overseas, he made his political comeback in 2009. In the 2014 presidential election he campaigned on an anti-poverty platform, saying he wanted to reduce unemployment and create new jobs. Joko Widodo - known universally as Jokowi - comes from humble beginnings but first came to international prominence by becoming governor of Jakarta in 2012. In the 2014 presidential election he campaigned on a "man of the people" anti-corruption platform, promising to tackle poverty and to stamp out nepotism and intolerance. Under his leadership the economy has grown steadily, the poverty rate is falling and some key infrastructure projects have been finalised - including a much-needed mass rapid transit network in the capital, Jakarta. But he has disappointed some supporters by abandoning campaign promises to resolve human rights violations. He has also been working to attract foreign investment from places like China, but his critics have accused him of not protecting national interests. His opponent has accused him of selling the country to foreigners. What are the key issues for Indonesians? Infrastructure, corruption and the economy will all be on voters' minds. But the central issue this election will Indonesia's national identity and whether it is taking an increasingly Islamic political path. Indonesia has no official state religion but more than 80% of its people are Muslim. It is the world's most populous Muslim-majority country. Conservative religious groups have become increasingly vocal over recent years - rallying over cases like the blasphemy conviction of former Jakarta governor (and Jokowi ally) Basuki Tjahaja Purnama, known as Ahok. So the main presidential candidates have been working hard to display their Islamic credentials. Mr Jokowi, a religious moderate, surprised many by picking Ma'ruf Amin as his running mate. He's a powerful cleric who played a key role in the protests that led to Ahok's downfall. That was seen as an attempt to sway more conservative Muslim voters his way, but may have lost him some support among younger, liberal voters. Mr Prabowo has promised to protect Islamic leaders and increase funding for religious schools, while respecting the constitution. He has earned endorsements from the Prosperous Justice Party, the largest Islamist party in parliament. He has picked as his running mate a young, savvy, politician called Sandiaga Uno, who also happens to be one of Indonesia's richest men. Analysts are predicting a significant number of voters will decide not to vote at all this year, feeling disillusioned with Mr Jokowi but unwilling to back the overt Islamist politics of Mr Prabowo. Who are the key voters? According to the Elections Commission, around 40% of eligible voters will be aged 17 to 35 - around 80 million people. And parties have been trying their best to attract the youth vote - sometimes in innovative ways. Last year Jokowi's party, the PDIP, launched "fashionable" merchandise including T-shirts, hats and jackets. Mr Prabowo has been building up relationships with vloggers, YouTubers and influencers, according to a report by the Institute of Southeast Asian Studies. Supporters of both candidates have also created their own music videos, complete with catchy tunes. Social media is king in Indonesia - it has the fourth-highest number of Facebook users in the world - and the country has been plagued by fake news problems. Mafindo, an Indonesian organisation fighting fake news, said political fake news and disinformation shot up by 61% between December 2018 and January 2019. The group's co-founder told Reuters that a large proportion of the misinformation targets Mr Jokowi, making him out to be a Christian, of Chinese ancestry, or a communist. These may not sound like dramatic claims - but they're big accusations in Muslim-majority Indonesia, where race and ideology are especially sensitive issues. 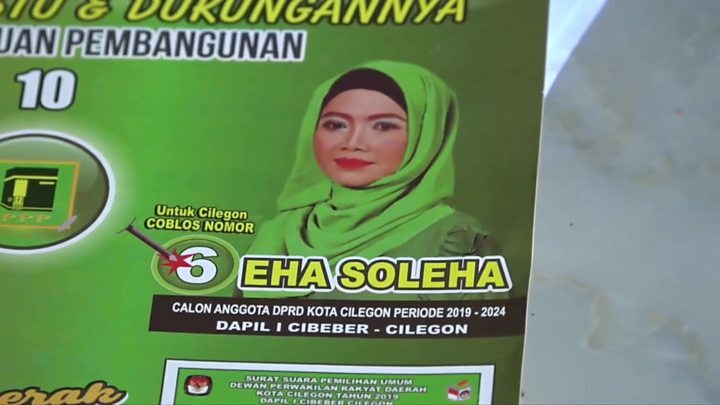 Who are Indonesia's election rivals?